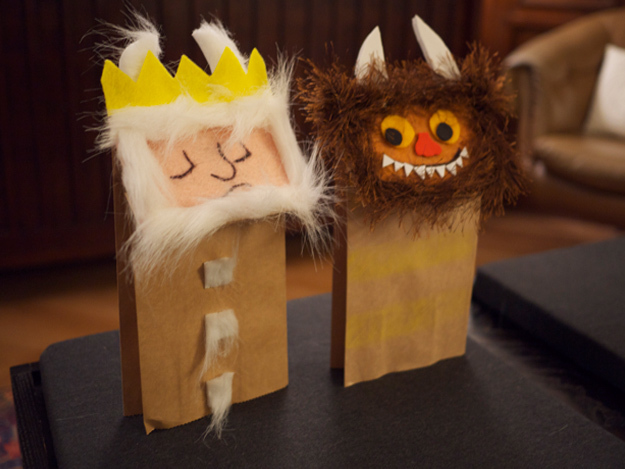 Are these the most incredible paper bag puppets you’ve ever seen? I thought so too. Our friends Sarah (creative visionary with a deluxe craft room) and Justin (artist and musician) kindly made them for Soren. He was amazed when S+J arrived with two of his favorite Where the Wild Things Are characters in 3D. Max’s private boat is a reoccurring theme in our sidewalk chalk drawings, and we’ve read the book so many times that Soren recites Max’s lines as if they were his own. As great as his affinity is for this classic tale, the reading with supporting puppet show that night might have been even more fun for us adults. The DIY power couple claim that the puppets inspired by Pinterest boards were easy to make. They used heavy duty paper craft sacks, foam trimmings, felt, fur and lots of imagination. A paper bag character (Curious George, Madeline, Babar) coupled with a favorite book really brings a story to life, and would make for a perfect shower, birthday or holiday gift. This entry was posted in create and tagged Maurice Sendak, Where the Wild Things Are by lhouse. Bookmark the permalink.